Rabbi Sigma Faye Coran became Senior Rabbi of K.K. 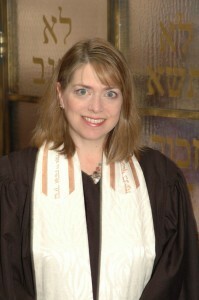 Bene Israel Rockdale Temple on July 1, 2004, and was the first female Senior Rabbi to serve a Cincinnati congregation. Born in St. Louis, Missouri, Rabbi Coran grew up in Akron, Ohio. Rabbi Coran studied Clinical Psychology and Biology at Tufts University. She was ordained at Hebrew Union College, Cincinnati, Ohio in 1993. Before coming to Rockdale, Rabbi Coran served congregations in Ann Arbor, Michigan, and Worcester, Massachusetts, and was the Jewish Chaplain at Williams College. Rabbi Coran is proud that she has been active in a variety of social justice organizations. She recently attained a Doctor of Divinity degree from Hebrew Union College in honor of her 25 years in the rabbinate. 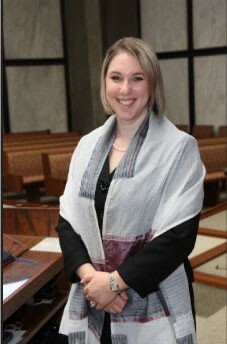 Rabbi Coran lives in Cincinnati with her husband, Rabbi Matthew Kraus, and Eden, the youngest of their four children. As a parent of children spanning from elementary school to post-college, she’s “on the same page” as many who seek community at Rockdale. As a questioner, she keeps us searching. Rabbi Coran has been a leader in Ohio Religious Action Center, a social justice movement across our state. She is an avid reader, a media-watcher, and most importantly, a great listener–three traits that spark conversation and connection. We’re glad that she will guide and challenge us, comfort, and laugh with us for many more years! Click here to contact Rabbi Coran. Rabbi Kahan began her Jewish life at Rockdale Temple, the daughter and granddaughter of longtime Rockdale members. She studied social work at THE Ohio State University, where she was active in Hillel, and directed the MeshugaNotes a capella group. Rabbi Kahan was thrilled to return home to Cincinnati for her rabbinical education at Hebrew Union College. She served Rockdale as its Rabbinic Intern during her final two years at HUC, continuing her work with the congregation’s worship, music, youth, outreach and education programs, and of course, building relationships with Rockdale members. Rabbi Kahan was ordained from HUC in 2013, after completing her thesis focused on the use of sacred music in teaching children how to pray as Jews. Immediately following ordination, she began serving as Rockdale Temple’s Assistant (now Associate) Rabbi & Educator. Rabbi Kahan is a life-long lover of books and music, enjoys traveling, and can be found cheering on the Buckeyes year-round! Rabbi Kahan, along with her husband Sean Flowers, their son Seth and daughter Becca, feel blessed to be part of the Rockdale Temple family. Click here to contact Rabbi Kahan. Rabbi Goldman served as the 9th Senior Rabbi at Rockdale Temple from 1986 to 2004. Ordained in 1967, Rabbi Goldman served as U.S. Army Chaplain at Fort Hood, Texas during the Vietnam War; Assistant Rabbi of Temple Emanu-El, New York City; Chaplain of Memorial Sloan Kettering Cancer Center; and Rabbi at Temple Sinai, Lawrence, New York. Rabbi Goldman has served on the boards of Caracole House, Big Brothers/Big Sisters, and has been President of the Greater Cincinnati Board of Rabbis. Rabbi Goldman served on the Race Relations Council of Greater Cincinnati, is active in interfaith work, and received the Rev. Dr. Martin Luther King, Jr., Spirit Award in 2004. From 2004-2013, Rabbi Goldman served the congregation of Temple Bet Yam in St. Augustine, Florida. He and his wife, Meryl, currently reside in Sarasota, Florida.